Rugged solid HDPE 1-1/2" thick by 9-1/2" wide benches ranging from 36" to 96" long. They will never delaminate, fade or splinter even in the most extreme locker room or natatorium environment. Non-absorbing palstic and mark-resistant surface ensure years of service! Keeping with our continuous quest for innovation we decided to reinvent our standard plastic locker room bench. The standard way of thinking is to use a thick, heavy piece of plastic usually 1 .5 inches thick to create the bench seat. This type of material is costly and usually very limited in color choices. At Royal Plastic Lockers we discovered that we could create a bench seat using much thinner material --actually 3/4 inch thick material. Using our methods we are able to fabricate a bench seat that not only cosmetically looks as good as the standard bench but is available in wide variety of colors. So not only is our bench cosmetically pleasing and available in colors but we believe it is also as strong as our standard bench top. 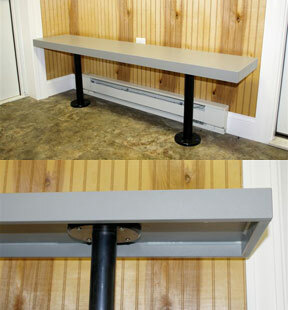 The fact that our bench top weighs less means that it will cost less and it will also lower shipping costs. Royal Plastic Lockers is once again keeping with our mission to take standard ideas and use innovation to make them better. Our aluminum fabricated bench pedestals are manufactured in our facility on CNC machining equipment. 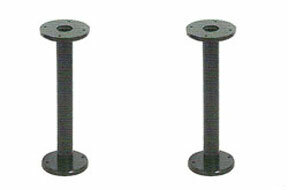 The pedestal end plates are machined out of solid 6" diameter 6061 aluminum billet to a thickness of 5/8" and aluminum welded to a heavy wall aluminum tube. The assembly is then black anodized so it will stay looking new for a very long time and will not rust or corrode. Hardware for attachment with benches is included. A wide range of accessories including bases, number plates, end panels, slope tops, cubbies, and various locks let you tailor your locker order to meet your project requirements.